A team of astronomers using the NASA/ESA Hubble Space Telescope has discovered a fifth moon orbiting the icy dwarf planet Pluto. Pluto’s new-found moon, visible as a speck of light in Hubble images, is estimated to be irregular in shape and between 10 and 25 kilometres across. It is in a 95 000 kilometre-diameter circular orbit around Pluto that is assumed to lie in the same plane as Pluto’s other known moons. “The moons form a series of neatly nested orbits, a bit like Russian dolls,” said Mark Showalter of the SETI Institute in Mountain View, USA, leader of the scientific team that discovered the new moon. The Pluto team is intrigued that such a small planet can have such a complex collection of satellites. The new discovery provides additional clues for unraveling how the Pluto system formed and evolved. The favoured theory is that all the moons are relics of a collision between Pluto and another large Kuiper belt  object billions of years ago. Pluto’s largest moon, Charon, was discovered in 1978. 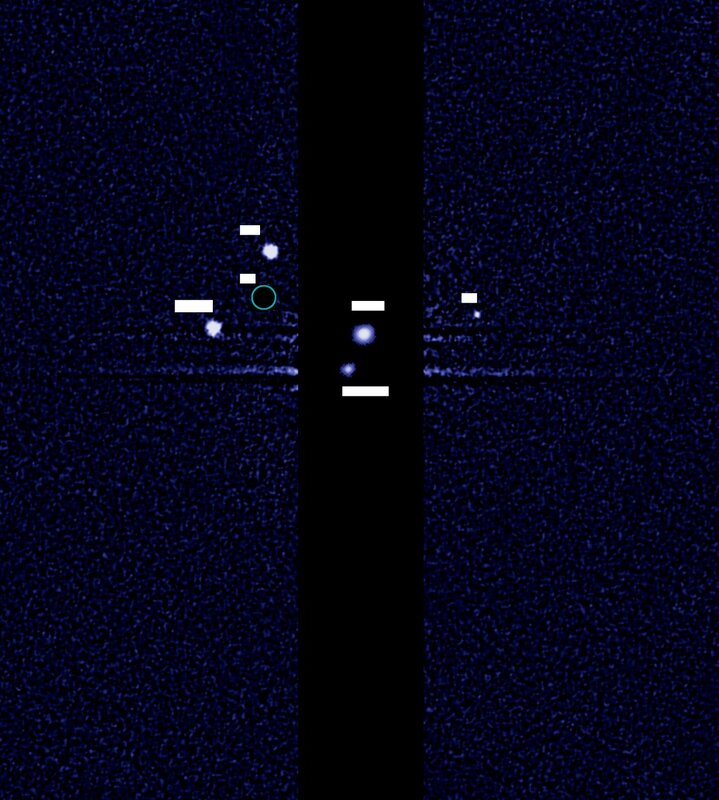 Hubble observations in 2006 uncovered two additional small moons, Nix and Hydra. 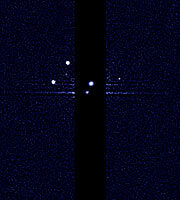 In 2011 another moon, known as P4, was found in Hubble data. 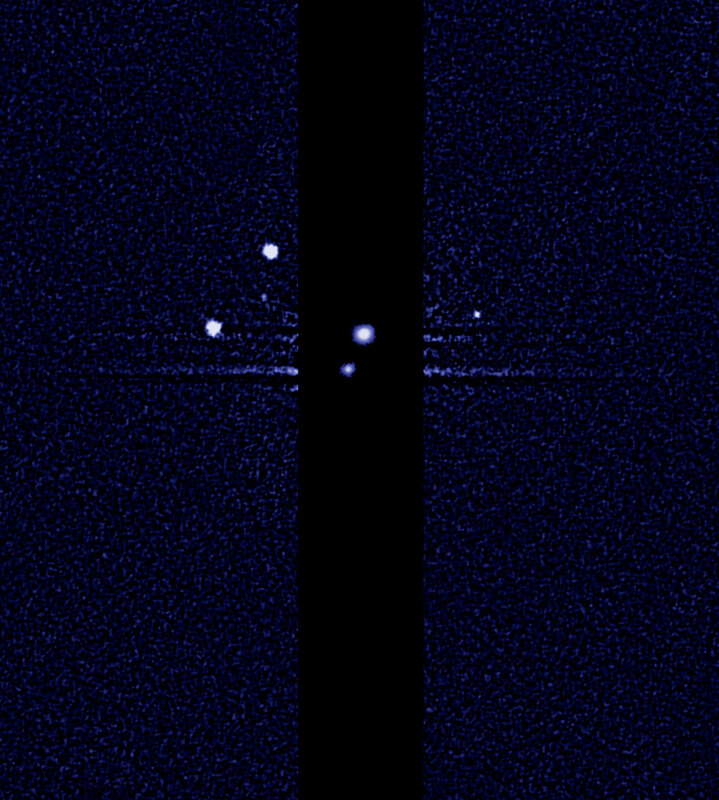 Provisionally designated S/2012 (134340) 1, or P5, the latest moon was detected in nine separate sets of images taken by Hubble’s Wide Field Camera 3 on 26, 27 and 29 June, and 7 and 9 July 2012. New Horizons, a NASA space probe, is currently en route to Pluto, with a high-speed flyby scheduled for 2015. It will return the first ever detailed images of the Pluto system, which is so small and distant that even Hubble can barely see the largest features on its surface. In the years following the New Horizons Pluto flyby, astronomers plan to use the infrared vision of Hubble’s planned successor, the NASA/ESA/CSA James Webb Space Telescope, for follow-up observations. The James Webb Space Telescope will be able to study the surface chemistry of Pluto, its moons, and many other bodies that lie in the distant Kuiper Belt along with Pluto. 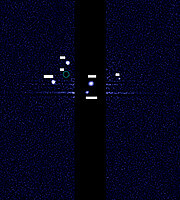 The Pluto team members are M. Showalter (SETI Institute, Mountain View, USA), H.A. Weaver (Applied Physics Laboratory, Johns Hopkins University, Baltimore, USA), and S.A. Stern, A.J. Steffl, and M.W. Buie (Southwest Research Institute, San Antonio, USA). The Kuiper belt is a region of space in the outer region of the Solar System which contains many small icy objects, and a number of dwarf planets including Pluto.